I've had this post sitting in my drafts for a while, but I suppose doing this post the day after a sponsored post is rather appropriate. Talking about sponsored/courtesy items is a topic that I think many bloggers don't feel comfortable talking about, or are not even sure how to talk about or what they'd say, exactly. Honestly I think many bloggers fear what their readers will say or some sort of backlash for discussing this kind of "taboo" subject. I can't say I haven't felt similar feelings, but it is a subject that I think about frequently, as a sponsored, monitized blogger, and I think being open and honest about it is a good thing. Everything in here is merely my own experience, as I'm sure there are many different ways people do things, some good, some bad. I can only speak to what I believe and have experienced. So here is my story. I started accepting sponsors in January of 2010 as a way to raise money for my Brave trip, and as a way to be able to make an income while I was on the road. After I settled in Tacoma, I started working for Freckled Nest, on top of blogging, and I also got another job as a barista to supplement my income as a designer and blogger. The time I spend photographing outfits, recipes, and projects, editing photos, writing copy, responding to emails from both readers and sponsors, and being active on social media is equivalent to at least a part time job. Since leaving on the Brave trip, any "normal" job I've taken has been for the purpose of supplementing the income I make designing and blogging to allow me to have the time necessary to do what I'm passionate about-- which is blogging! 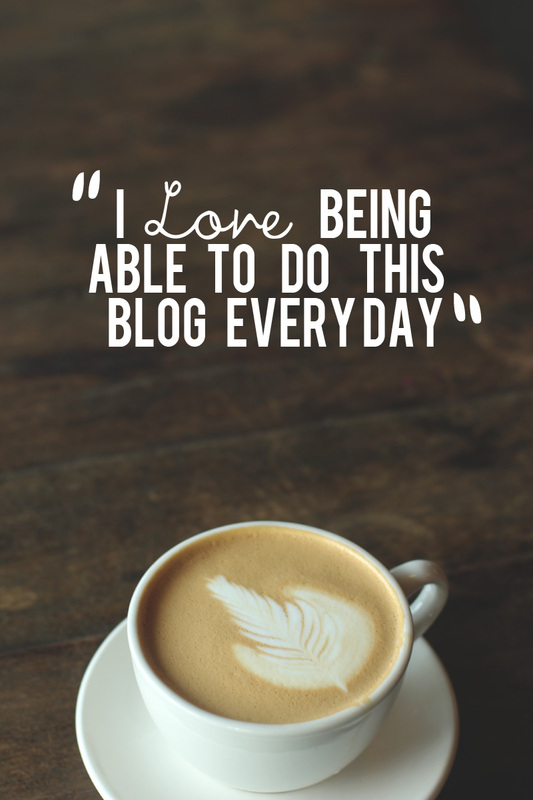 I love being able to do this blog every day, and am so thankful that can do so. First off, I'll define what I mean when I say courtesy or sponsored item, since sometimes there is confusion as to what that even means. I mean that the shop/company has given me the item with the understanding that I would wear the item on my blog in a style post, linking back to their site in the outfit details. In the past two years of having sponsors, I've received thousands of dollars worth of clothing courtesy of those sponsors. Pretty much every single item of clothing I've received has been chosen by me. Sometimes sponsors give me a list of items they'd prefer I choose from, but by and large, they've allowed me to choose what I wanted to style, when it came to receiving a courtesy item. Would my style be different if I hadn't received sponsored clothes? It's possible. Is my style completely and 100% "me", right now? Absolutely. Do I think that some bloggers change their style in order to receive free clothing from sponsors? Probably. It's disappointing and unfortunate, but I'm sure it's sometimes the case. Personally, I've turned down offers to receive courtesy items if the shop/company doesn't reflect my personal style, or if I couldn't figure out a way that I would style any of their items. Usually this isn't the case, since most shops who choose to sponsor me recognize that my style matches up with their merchandise and, likely, the style of their customers. Many outfits I put together are composed of articles of clothing or accessories that I've received from various sponsors over the past two and a half years. I would venture to say there are more things in my closet that I received courtesy of a shop than items that I went out and bought. Did I receive them for free? Yes. But also, no. I work hard on my blog. Like I said, the time spent working on Delightfully Tacky is probably at least that of a part time job. So in exchange for that work, sometimes I receive actual money from sponsors who purchase ad space, but sometimes the payment comes in the form of clothing, or a clothing allowance. To be completely honest, Dan & I don't have a clothing allowance included in our budget because my monthly sponsored clothing is enough that I don't have to shop. Instead of getting paid money, and then budgeting that out into a clothing allowance, I don't give myself money in our budget for clothing. If I want something other than what sponsors provide me, I usually thrift it. I try not to put together outfits that are comprised wholly of sponsored items from one shop, but it happens. I'm not going to not wear an outfit I enjoy because it's comprised solely of sponsored items. Perhaps I'll look like a walking advertisement for that shop, but if I love the outfit then why shouldn't I be a walking advertisement? The amount of times I've been a walking advertisement for Target, or Ruche, or ModCloth is too many to count, but I honestly love the styles that I've gotten from those shops (and others). So, do I buy my clothes like I used to before I had blog sponsors? No, I definitely don't. And yes, that's kind of weird. Maybe even really weird. If someone had told me when I started blogging that I would receive any clothing courtesy of sponsors, I would've been blown away. I didn't set out with receiving sponsored clothing as my goal. I just put together outfits I loved, and tried to figure out my style along the way. I'm completely flattered that companies and shops that I love choose to send me clothing. I only work with sponsors that I feel comfortable working with. If a sponsor request even feels weird, or sketchy, or "off" I'll decline. There have been only a couple times when I've gone ahead with a sponsor that felt kind of weird and it wasn't good. I've learned to trust my gut. Even if everything else seems good to go, if I feel weird about it, I won't move forward. Are some courtesy items more expensive than I would typically spend if they weren't being given to me? Yes. I'm very frugal when it comes to clothing, which is why I'll typically go thrifting if I want to buy new clothes. So sometimes courtesy items are items I wouldn't buy if I was laying down cold hard cash for it. I've even received items that I didn't know the price of until I looked it up when linking to it in an outfit post and was kind of astounded at how spendy it was. Again, I know that's weird. It's weird for me even. Here's the economic fact about sponsors. They sponsor a blog because the believe that blog can drive traffic to their shop or website. And ultimately, they want to drive traffic in order to make a profit. Whether it's ModCloth or a brand new handmade etsy shop, a sponsor purchases an ad and sends courtesy items to increase exposure of their shop, with the ultimate goal of the blog's readers seeing the item, wanting the item and then purchasing the item. So, the bigger a blog's readership, the more exposure the sponsor will get, which is why it appears that "bigger" blogs get more sponsors. They do! They have the sheer quantity of traffic that will get more clicks to the sponsors site. This doesn't mean that if you have a smaller blog, that sponsorship is out of the question. A lot of smaller etsy shops or blogs can't afford to sponsor a larger blog, who have higher prices for ads, so they'll look for a blog that is more affordable to sponsor. A smaller blog will often have lower prices on their ads because they can't offer the amount of clicks or views that a larger blog can. My ad prices are lower than, say, A Beautiful Mess, because I can't offer as many clicks or views as that blog can. But my prices are higher than a blog with less traffic, because ultimately the sponsor is paying for exposure. 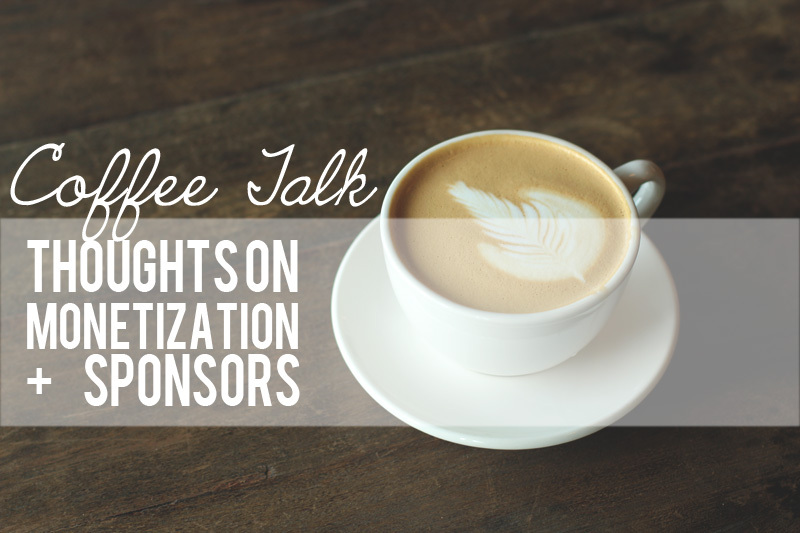 And the cool thing about sponsoring blogs is that you can target a very specific demographic when sponsoring a blog. Outdoorsy blogs are sponsored by outdoor companies, vintage blogs are sponsored by vintage shops, wedding blogs are sponsored by wedding planners and photographers. And it opens up the ability for smaller etsy shops, and the like, to being able to advertise their shops. A small etsy shop probably can't afford to advertise on Martha Stewart, but could totally advertise on a blog where the readers are likely to enjoy that shop's products! I know not everyone likes seeing ads or courtesy items on blogs. Some bloggers are very anti-sponsorship, while others make a living off of it. In my mind, it's a personal choice. 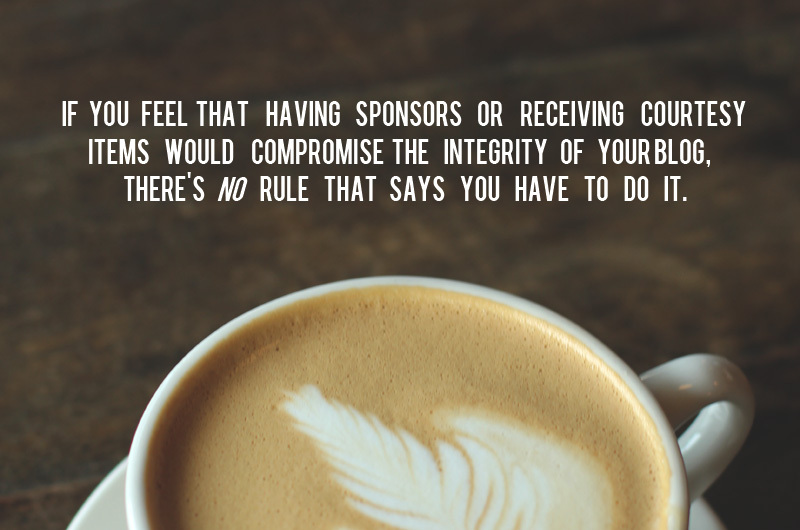 If you feel that having sponsors or receiving courtesy items would compromise the integrity of your blog, there's no rule that says you have to do it. I've personally felt incredibly blessed to be able to work with the sponsors I've been working with over the past few years of being a monetized blogger. This is just my own story, I don't know the perspective of other bloggers, other than the few I've talked to personally. I'm all for transparency and honesty when it comes to blogging, which I think is a good precedent in all walks of life, really. I realize that sometimes blog readers aren't aware of the behind the scenes stuff when it comes to blogging. Yes, I make money from blogging. Whether it's through the ads you see in my sidebar, clothing I receive courtesy of a company, or the very occasional sponsored post (which means I was paid to write the post), or commission off of affiliate links (meaning if you purchase an item after clicking the link from my blog, I get a percentage of that sale), or e-courses, I make money off of this blog. I don't know if that will still be the case next year or in five years, but for now a portion of my income is from blog related activities. I do my best to be honest and careful about how I do my sponsorships, but I know that you can't make everyone happy (especially on the internet). If you have any questions about sponsorship, or if you'd like to start monetizing your own blog I'll do my best to answer any questions you guys have in the comments. And if any of you are monetized bloggers, I'd love to hear your thoughts on this topic in the comments as well!